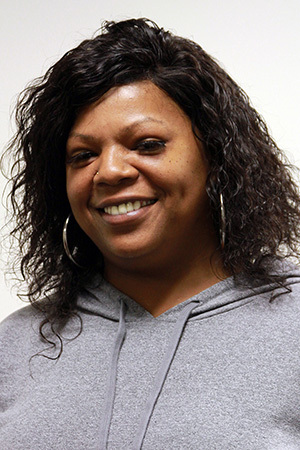 Latasha White is MCCC's 2018 Commencement student speaker. 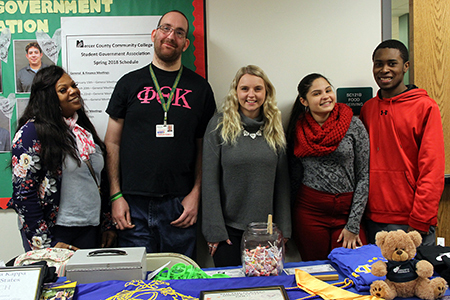 Latasha White, far left, with fellow members of Mercer’s chapter of the Phi Theta Kappa National Honor Society, second from left to right, Charles Dubell, Keighley Webb, Daniela Figueroa, and Justin Ellis. West Windsor, N.J. – As the mother of three sons, Latasha White of Trenton is considered a non-traditional student. White has not only proven that success can come at any age, but that adults are often guided by strong convictions and a sense of purpose that fuel that success. Having been the primary caregiver for her mother, who passed away from cancer in 2010, White decided in her 30’s to trade in her desk job in accounting for a profession where she could help people, especially the elderly. Earning dual degrees in Public Health (May 2018) and Nursing (December 2018), she will be prepared to assist the elderly who are most in need. White was 33 when she enrolled at Mercer and was pursuing higher education for the first time. Dipping her toes in with evening classes, she decided she wanted the full college experience as a day student. “I wasn’t going to let my age stop me," she said. White has been true to her word, serving as a vice president of Mercer’s chapter of the Phi Theta Kappa National Honor Society, as treasurer of the Student Nurse Association, and as a member of the Student Government Association. She has been a peer tutor and a member of the Math Club. She currently works in the Transfer Office, where she often offers peer-to-peer advice. A self-described math and science geek, White was nominated for commencement student speaker by one of her math professors, who described her as a “remarkable student,” one who has exceled in Honors courses and the Nursing program. “My professors were able to see something in me. I began to see myself through their eyes,” White says.